benf.org : other : cfr : Illegal identifiers - (For obfuscation or otherwise). One possible attempt at obfuscation (again, as with renaming duplicate identifiers, this is such a simple transformation it's probably not worth the name 'obfuscation'....) is to hack the const pool of a class to give members / methods names which are not valid identifiers. It's more complex than you might think! Java is very friendly to non-ascii languages, and allows unicode identifiers, so as to facilitate development in non-english languages. Because of this, it's not as simple as writing a small regex to determine if an identifier is valid - I encourage you to look at java.lang.CharacterData, java.lang.CharacterData00, java.lang.CharacterData01 etc if you don't believe me! Instead, we make use of Character.isJavaIdentifierStart & Character.isJavaIdentifierPart - please see Java Language Spec 3.8 for details. So what if we hack invalid ones in? Here, I've used a hex editor to alter the constant pool so that I have both members and methods with spaces in their names. 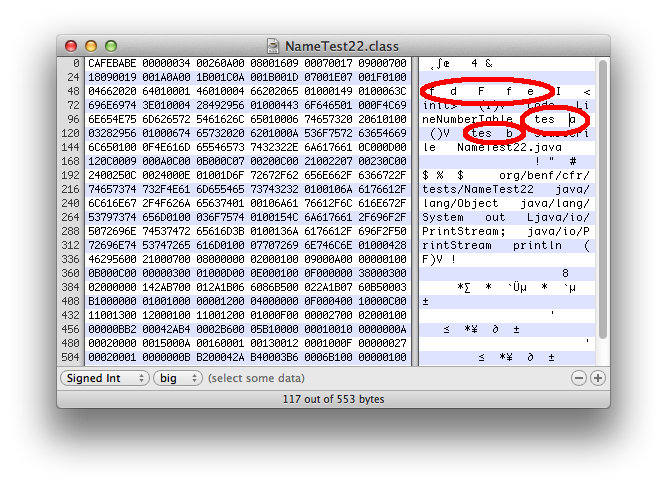 If we decompile this as is, it produces illegal java. * Decompiled with CFR 0_93. I've left enough information to disambiguate identifiers, but of course, I could have renamed them entirely to spaces as well! Please note: CFR will not automatically enable this flag. Why not warn if there are any illegal idents used?